For five years, a goat tying jackpot with a very unique format has intrigued, entertained, frustrated and thrilled cowgirls in western North Dakota. Bowman has been the home of the Ty Tuff Challenge since its inception in winter 2012. This year's challenge, on July 29, provided more than $25,000 in cash, prizes and scholarships in just one day of goat tying and breakaway roping. Ninety-six goat tiers and 100 breakaway ropers were in attendance. The Ty Tuff Challenge is the only goat tying jackpot of its kind. The idea came to current secretary, Stacy McGee, while she was watching a 4D barrel race. McGee brought the idea to Ty Tuff clinicians, Kayla (Nelson) Spickelmier and Deb Gunderson, and the three created a goat tying jackpot with a 4D format. The Ty Tuff Challenge was born. For those that aren't familiar with a "4D," it is an attempt to allow more contestants to win money, while still encouraging them to strive for a fast time. The overall fast time in a round wins the 1D. Adding one second to the 1D time results in the winner of the 2D (or whomever is closest), and so on, down to the 4D. For example, if the fastest time in the first round is a 6.5, that is the winning 1D time. A time of 7.5 seconds would lead the 2D, 8.5 the 3D and 9.5 the 4D. At the Ty Tuff Challenge, money is awarded down to six places in each "D."
"It's a really great format for junior high all the way through college and beyond to be able to compete in the same event," Spickelmier said. "That's what we really wanted to focus on, is promoting and encouraging the youth of goat tying, because that is the future." The format allows the winner of the 4D to win the same amount of money as the winner of the 1D, which can be encouraging for young competitors, Spickelmier said. "Once you get done with college, yeah, you have the SDRA rodeos here, but, to a point, your career is kind of done," she said. "I think that's one of the biggest positives is being able to accommodate a wide range of goat tiers and have them be able to win the same amount of money and prizes across the board. It's a really awesome way for Ty Tuff to give back to people, too." Sponsorships are a huge part of the Challenge's ability to award cash and prizes to competitors. King's Saddlery from Sheridan, Wyo., is the main sponsor of the event. "We have a really good business relationship with them. They make all our strings. They were really excited about it," Spickelmier said. Bowman Tax and Tourism also is a huge contributor and smaller sponsorships fill in the gaps. 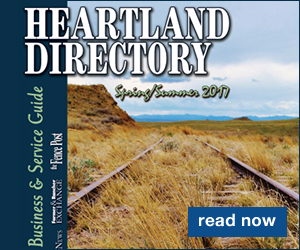 They are "places we do a lot of business with, as ranchers," Spickelmier said. "We hope to continue to grow and reach out to more businesses." The history of the "Ty Tuff" name goes back farther than the first Challenge in 2012. The original Ty Tuff founder, Deb Gunderson, began teaching goat tying clinics in the 1980s. "She studied Roy Cooper calf roping videos a lot and kind of designed our style from that," Spickelmier said. Gunderson also invented the Ty Tuff goat tying dummy, the only one of its kind. When Spickelmier was in college, she started team teaching Deb's clinics. "Right after college is when I started taking over," she said. Spickelmier is now the lone Ty Tuff clinician, and her resume in the arena is quite impressive. 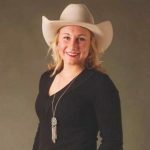 She qualified for the national high school finals rodeos all four years of high school, and three of those times were in goat tying. 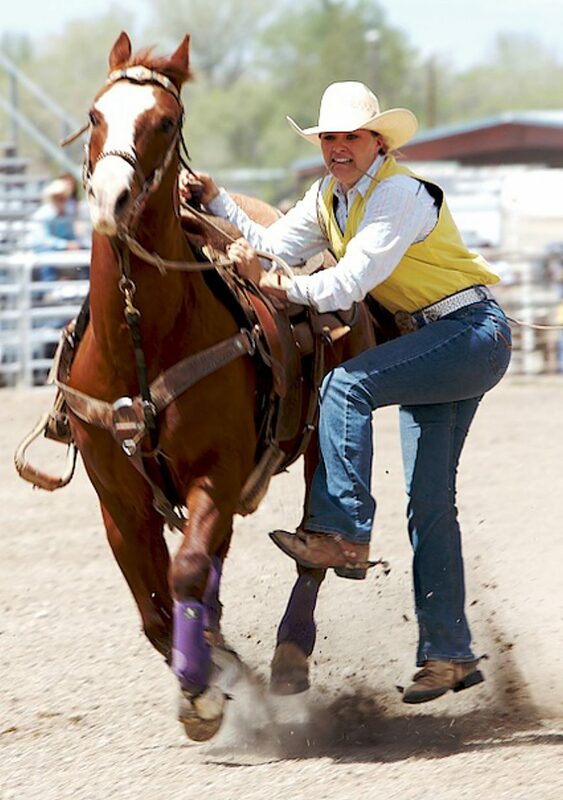 She won the Rookie All-Around award her freshman year, and won rounds at the finals rodeos in the following years. She was twice a College National Finals Rodeo champion goat tier, and qualified three total times. Once, her team at the University of Wyoming won the women's title, and in 2005, she was the Central Rocky Mountain Region All-Around cowgirl. Spickelmier now keeps busy helping on her parents' ranch northwest of Buffalo, South Dakota, working for a veterinarian from Ekalaka, Montana, part-time and putting on 12-15 clinics per year. 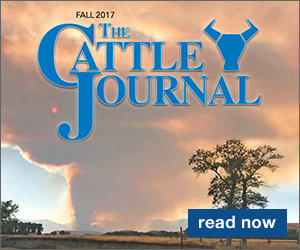 See the Aug. 5, 2017, edition of Tri-State Livestock News for results from the 2017 Ty Tuff competition.